Shortly after our little one was born we started frequenting a grill just down our street. When I got tired of cooking or if the baby was having a rough night I sent the hubby to get take-out. Their open face hanger steak sandwich was always my favorite until I discovered this salad. 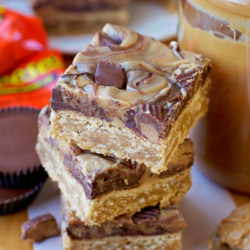 It’s bursting with peanutty flavor, which is always a plus for peanut butter lover like myself. I made it a goal to replicate their salad, you know to save a little money and to bottle that amazing dressing for other uses. It’s seriously sooo good! After planning out our grocery list for the week and doing some recipe research, I realized that I already had the ingredients I needed for the dressing… score! With all of my ingredients prepped and ready to go, I plated my salad and tossed on all of the fixings. I found a lot of them at my grocery store’s salad bar… Harmons is the best! And to make things even easier I swung by the deli counter and had them slice me a thick piece of Boar’s Head low sodium chicken breast. 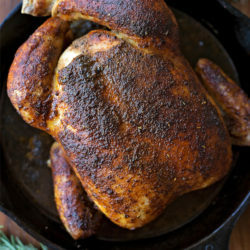 It was much easier & faster then cooking my own at home. Then I used my mini food processor to emulsify the peanut dressing. Just put in all of your ingredients in (yes it’s quite a long list) and pulse away!!! 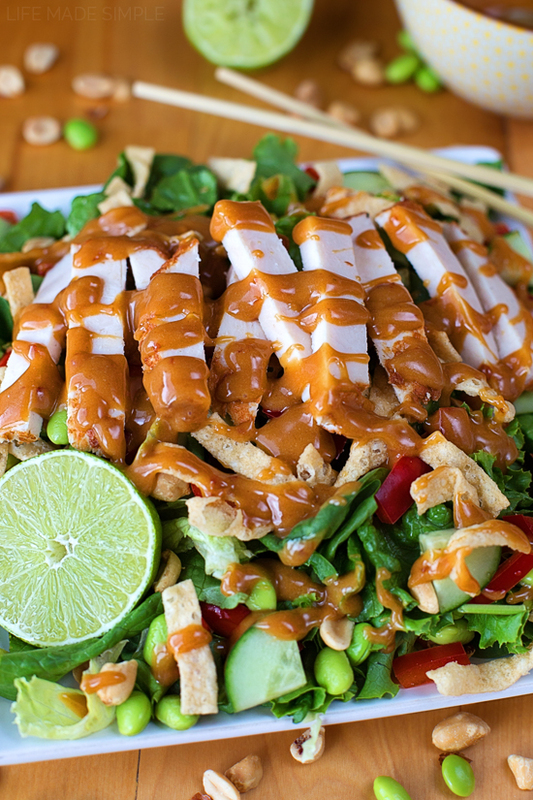 This sweet and spicy dressing has so much flavor packed into it, you’re going to love it! 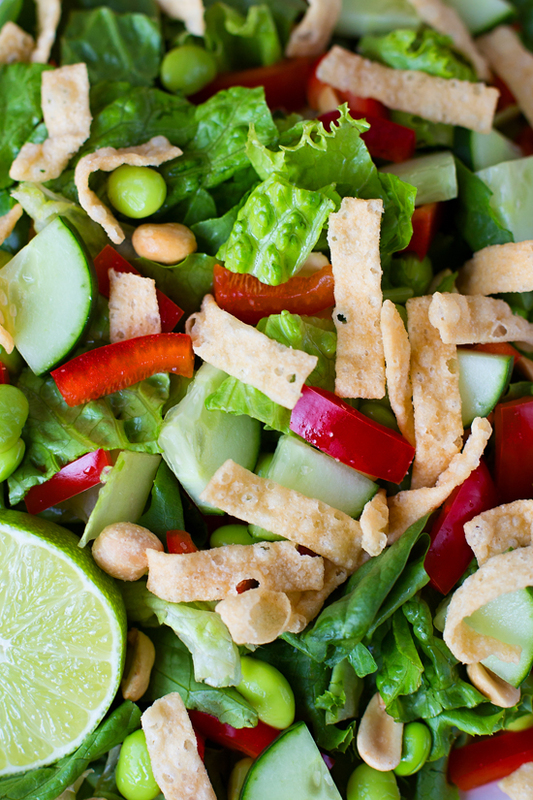 Drizzle that liquid gold over your salad, mix it all together and dig in! You can easily share this for lunch or eat it all by yourself for dinner 🙂 It’s super fresh, filling and flavorful- so delicious you’re going to want to make it time & time again. Enjoy! 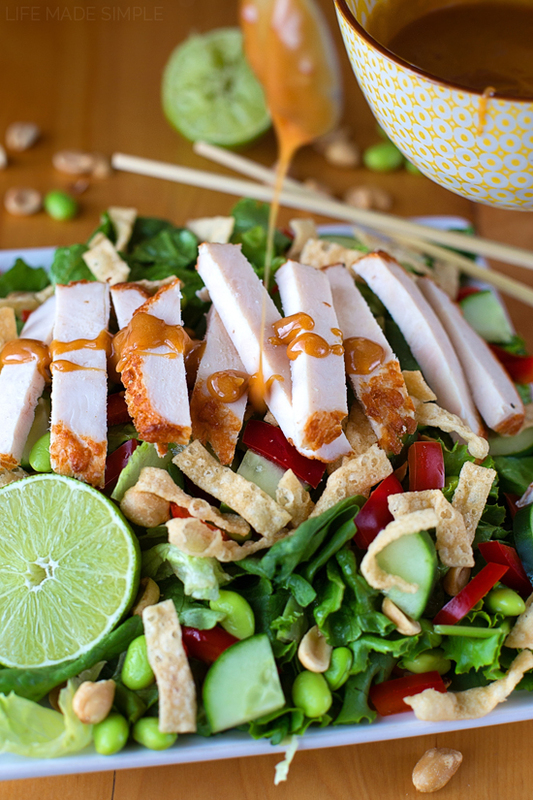 Inspired by a cozy little grill just down our street, this Thai chicken salad with peanut dressing is fresh, crisp and bursting with amazing flavor. It's a favorite!!! To prepare the dressing, combine all of the ingredients in a food processor and puree for 30 seconds (note: if you do not have a mini food processor you can chop the cilantro by hand and whisk vigorously to emulsify it by hand). 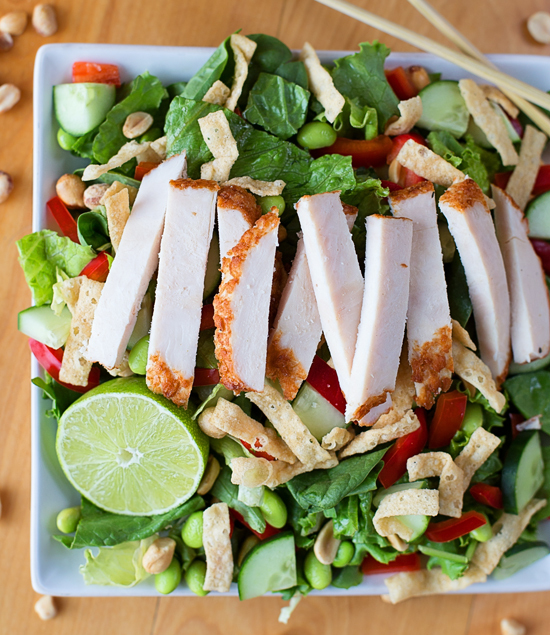 To assemble the salad, plate the greens and top with the chicken, edamame, cucumber, bell pepper, peanuts and wontons. 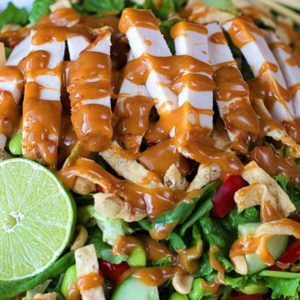 Drizzle the dressing over top, garnish with additional cilantro or thin slices of green onion. 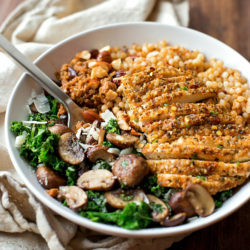 -Corn, carrots and cabbage all make great additions to this salad! I HAVE to try this. You’re killin’ me, man. That is all.